Pre-Owned, Excellent Condition. Clean Clear Glass, Snappy Aperture. This was VERY Lightly used and looks GREAT! The lens features a bright, 'fast' f:1.4 aperture, and it takesSharp pictures! The focus is smooth and sharp, and the aperture blades are clean & free of any oil or other residue. Made in Japan. If this is the case with you Signature Required. MINOLTA MAXXUM AF 50MM 1:1.7 (22) 49MM CAMERA LENS JAPAN With Hard Leather Case! Everything is in good shape. Included is Lens, lens cap, filter ring?. & heavy duty leather hard case with carrying strap. I did my best to provide quality pictures to show the condition of the item. Lens is in good condition. No fungus/haze/oil. Has internal dust but does not affect pictures. Lens filter ring has a dent so you cannot use filters. The Focusing ring moves well and smoothly. The aperture works well. The aperture blades have no oil. Minolta 50mm f1.4 MD Rokkor fast manual focus lens - Nice Mint-! 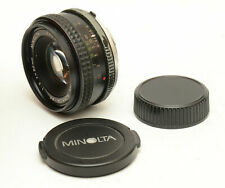 This is a nice & fast Minolta 50mm f1.4 MD Rokkor manual focus lens with a protective filter in exceptional condition! The lens hardly shows wear so I rated it a 9 condition! The glass optics are also clean with no scratches, marks, fungus or dirt. It focuses smoothly and the aperture works properly with no problems. MINOLTA rokkor-x 50mm f/3.5 MACRO LENS, sn2225865. It is manual focus lens. Used, good working condition. No other accessories are included. Lens Mount: Minolta MD. Lens Zoom: N/A. Focus: WORK. Aperture: WORKS GREAT. Minolta 50mm f1.4 MD fast prime manual focus lens f/ X700 & digital -Nice Mint-! This is a nice & fast Minolta 50mm f1.4 MD fast manual focus prime lens with a Minolta protective filter & caps in exceptional condition! The lens hardly shows wear so I rated it a 9 condition! The glass optics are also clean with no scratches, marks, fungus or dirt. It focuses smoothly and the aperture works properly with no problems. The lens is in perfect working condition. The overall condition is EX . MINOLTA MD Rokkor- X 50mm f/1.4 LENS SN3386857. It is manual focus lens. XG1 XG7 XG9 X-370 X-570 X-7, X-700, SRT 100 101 200 201 202, SRT SC. Used, good working condition. Pictures represents actual item. Lens Mount: Minolta MD. GREAT(small,light scratches check pic. Aperture: WORKS GREAT. Focus: WORK. What's Included: EVERYTHING ON PICTURES. ). Lens Mount: Minolta MD. EXCELLENT minus. Lens Zoom: N/A. Focus: WORK. Max 1.4 aperture. Everything works great. Lens only. Excellent image quality. GLASS: Front & rear glass & coatings are mint. Inside has 10mm area of small faint transparent marks. No haze or fungus. FOCUS: Manual focus smooth, proper tension. APERTURE: Works like new. No oil or damage. EXTERIOR: Near mint condition. Check the photos. Prior to that I was a police officer for 30 years and a high school teacher for 5 years. I was diagnosed with throat cancer and congestive heart failure (CHF) so I had to retire. Minolta MC Rokkor-PG 50mm f/1.4 Manual Focus Lens - Very Nice & Fast. XG7 Camera included. This legendary lens is in great condition and has no fungus or oil on the aperture blades and no haze. This lens is great for video and photography. The lens just has a couple of cosmetic marks. Included with the lens is the Minolta XG7 SLR camera. This camera is in great condition and works great. It has been tested and works fine. The camera is missing the rewind stick. But it has no effect on rewinding the camera. The leather on the side of the camera is perfectly attached to the camera. Also included is the original neck strap, the bottom half of the leather case and a UV filter. Lens Mount: Minolta MD. GOOD ( BUT HAS FEW SMALL MARKS ,CHECK PICTURES). Aperture: WORKS GREAT. Focus: WORK. What's Included: EVERYTHING ON PICTURES. Lens model is Minolta MD 50mm f2 lens, SN 1788190. Lens has been used. It shows light wear on the lens barrel from use. I would rate it at 8 (or above average) on a scale from 1 to 10. Lens Performance. Serial # 3092332 with Lens Cap. MC ROKKOR PG 50MM 1.4 Lens. Minolta SRT 101 Camara with strap. Our item number C1050. M/MD Vivitar 50mm 1:1.8 MC. 50mm f/1.8 standard lens. Sharp and compact. Just BARELY bigger than a pancake. High quality optics and ergonomics. Manual Focus. As due to age, lens may have average dust or minor imperfections. Recently we have had problems with people not understanding how their item works. Great condition - clear glass looks and works great! WELCOME TO WOLF'S! (THIS ITEM IS BRAND NEW IN THE BOX!) Minolta MD 50mm/f1.7 Interchangeable Macro Lens **More photos and details are available upon request. ** [Track Page Views With Auctiva's FREE Counter] (https://pages.ebay.com/seller-center/listing/listing-advanced-sellers/third-party-listing-tools.html#auctiva). Minolta MD rokkor-x 50mm f/1.7 lens in excellent condition! Glass is clean and crisp! Comes with a tiffen sky1-a filter. Does not include lens caps. If you have any questions please message me. Great condition. Glass free of any haze or fungus. Aperture blades clean and move freely. Includes rear cap. May have internal dust as is common with any lens. Does not affect photos. Minolta MD Rokkor-X 50mm f/1.7 Lens. Glass is in great condition and everything functions smoothly. Clean, shows almost no signs of use. Snappy and clean aperture. Smooth focus. No noticeable clear coat marks. The lens is in good condition with minor scuffs on the outside. The glass is free of scratches with no signs of fungus. Aperture and focus ring are smooth. MINOLTA MD 50mm F/2 1:2 Prime Lens Very Nice Lens! Minolta MD 50mm F2-2.8 1:2 Manual Focus Lens • Very good clean condition. • Optics seem to be very clean, no scratches. There is a little dust. • Focus is smooth • The aperture seems to stop down properly. • No known issues • No caps • Serial #1334718 Liquidating the estate of a lifelong camera repair technician. Much more to come! Used Minolta 50mm lens with front lens cap and filter, Lens In good Working Conditions, Front Glass shows Fungus Growing, will need cleaning. Glass/Optic : Front Glass Fungus. You will get exactly what you see on the Photos above. Mount : Minolta. Item location: Japan. Condition : Used Excellent Condition. Excellent : Show signs of moderate use / or slight signs of use. Excellent: Show signs of moderate use. 100% official genuine product. (I hold lens in my hand at eye level and put 10cm away from eyes. mold inside the lens. and write below what is visible with the naked eye from the front and rear lenses;. For Canada, EMS only. 1 - 3 weeks). This is a great quality, made in Japan lens by Minolta. This is a Minolta MD 50mm F1.7. This is a low light lens with amazing coatings and beautiful optical quality. It has the angle of view similar to the human eye and provides Fantastic quality images. Lens is in great condition with smooth action. Includes a skylight filter front cap and rear cap. In good working condition. has filter with it. Minolta MD 50mm f/1.7 Rokkor-X Lens. Lens Mount: Minolta MD. A standard focal length lens, suited for most general photographic purposes. They are ideal for available-light photography indoors and for other low illumination situations. Minolta MC Rokkor-PF 50mm F2 Lens For Minolta MD Mount! Good Condition!